ORLANDO, Fla. (CNS) — A standing-room-only crowd of young black Catholics in a frank session that lasted more than two hours told bishops, priests, and women and men religious why they stay in the church, what threatens to drive them away and that they want a stronger voice from church officials for the Black Lives Matter movement. 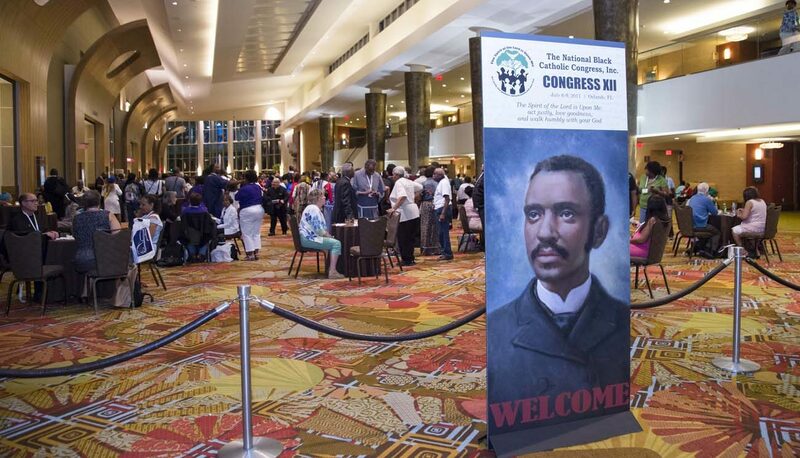 As the National Black Catholic Congress got underway in Orlando July 6 with more than 2,000 attendees, some 120 participants discussed ways to keep young adult black Catholics engaged in their parishes and the church — and raised criticism of, and an apology for, the church’s silence regarding the movement spawned by the killings of unarmed blacks by police. Among the bishops attending Congress XII was Archbishop Christophe Pierre, apostolic nuncio to the United States. Discussion centered on key themes: Why young black adult Catholics stay in the church; why they leave; how they live out their faith; how to foster more vocations; and the state of race relations in the U.S.
“How do we respond as people of faith to issues of race that have always been going on in society but especially in light of the Black Lives Matter movement? And in a lot of the police killings, a lot of people feel that the church has been almost silent in its response,” Stacy Allen, one of the facilitators, said toward the end of the session. That prompted Auxiliary Bishop Fernand Cheri III of New Orleans to stand. With a bow to those in the room, he said, “To the black youth, I apologize to you as a leader of the church because I feel we have abandoned you in the Black Lives Matter movement and I apologize. He then went on to tell of challenges in his own journey as a priest and a bishop, his outreach to bring young people, and starting choirs in parishes. “You’re going to struggle and you’re going to persevere,” he said. He counseled that young black adults reach out to each other and others within their parishes and church communities. Many at the session spoke of the need to address a lack of programs for young adults and meaningful engagement and leadership opportunities within parishes and the larger church. Young adults want more than to be tapped to set up tables, take out trash, run kids’ programs and generally do things that older parishioners don’t want to do, participants said. Too many parishes have youth programs that end at high school — and nothing for those who come back after college with talents and skills and a willingness to get involved, participants said. It’s particularly difficult for young black Catholics not in large metropolitan areas like Chicago, Atlanta or Washington with black churches. “People leave because there’s just no community,” said one young woman from Lansing, Michigan. While a participant from New Orleans said the reason she stays Catholic is the strength of her parish community, she has encountered resistance in other parishes. “One reason young adults are leaving is that sometimes it feels like the church does not want us,” she said. She said she’s tried to volunteer and has been told “no because of age, or no because they don’t say it, but because I’m a young adult, and they think I’m too young to know about that, or no because that’s ‘too black’ and that might be fine for your church in New Orleans but not here,” she said. The rejection is like “asking for a hug and someone is crossing their arms,” she said, recounting how she and a young Asian woman were “shut down” in a parish in San Francisco when trying to introduce new programs. Applause, laughter and murmurs of recognition swept through the room as participants from New York, California, Louisiana, Texas and elsewhere shared their experiences and ideas. One mistake is to mix up “youth” programs with “young adult” programs without recognizing the huge differences between them, some participants noted. One mentioned having a young adult “meet and greet” to get ideas for programs they want — and then implementing them. Participants from Nigeria and other African nations shared their experiences of encountering cultural differences assimilating into U.S. parishes, the lack of welcome, and some of the strong communal faith traditions they know from their homelands. Programs focused on prayer and spiritual, not just social, needs are important, participants said. Afterward in an interview with National Catholic Reporter, Allen, who is from the Galveston-Houston Archdiocese, expanded on the issue of race relations and the lack of support for the Black Lives Matter movement by the church. “It’s been painful that a faith that I love so much and I dedicate quite a lot of time to feels like it hasn’t seen my own humanity, hasn’t seen my own pain,” said Allen, who is an attorney and serves in her parish counsel, youth ministry and catechism programs. Bishop Cheri in an interview said bishops haven’t been more supportive because they haven’t really understood the Black Lives Matter movement, relying more on media reports than talking with black people within their dioceses. “One of the primary teachings of the church is the value of human life and human dignity, and if Black Lives Matter is not a matter of human dignity, something is wrong,” he said. “We (bishops) speak out for many things and we stand for many things and I think we stand for life. I’m not saying I’m against police — it’s not a question of that, it’s not a question of for and against. It’s about life at all levels and all times,” he said. DeGeorge is editor of Global Sisters Report, a project of National Catholic Reporter, based in Kansas City, Missouri. Human beings are made in the image and likeness of the divine.